Click on the forum where you want to post a topic. Fill out the form that appears… and click on Post. SUBJECT: Try to type a very short, but descriptive subject line. EDITOR: The editor is the same as the one used for many other tools such as in Resources, Schedule, etc. MESSAGE: Place the body of the message in the text area. If you wish to view in html format, click on the Source icon at the top left toolbar. SET TOPIC AS: This refers to the nature of your topic. The default is set to normal. Students (participants) can only post “normal” topics. Normal topics are listed in chronological order, with the most recent discussion topics at the top, so that class members can see easily the newest contributions. However, you can force topics to be above others, depending on the topic type. Instructors can also post “sticky” (anchored) and “announcement” and “reusable” topics. Learn more about Topic Types. Attach: User may attach documents to your message. Click the “Attach” button at the bottom of the screen. File size and types of attachments are set by the system admin for the server. The software allows you to upload most standard attachments. If you are trying to attach a file and it is not accepted, contact your system administrator as its extension may need to be added. The default upload limit is 100 MB in total for all 3 files that may be uploaded per topic. You may upload up to three attachments when posting a topic. After you attach files, you must click on “Post” to post your message with its attachments. (Note, when you click on the Attach button, it appears under the Post / Attach Files bar. You’ll have to scroll down to see it). 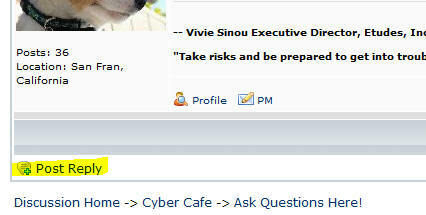 Preview: You may preview your topics, replies or private messages by clicking on the Preview button. Post: This will post the new topic to the forum. To cancel your operation, just click on the Back button of your browser, or the Discussion Home links at the top of the forum. If you don’t click on Post, your topic won’t get posted. Once you post your message, you will be taken back to the forum you were posting to and you will see your topic posted. 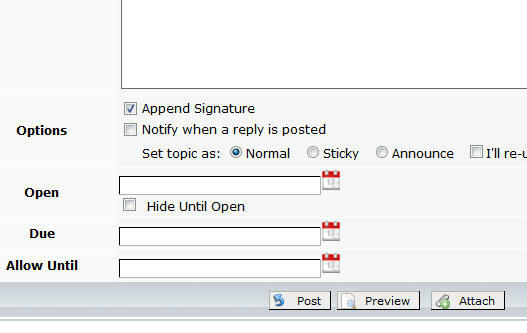 ‘Post Reply’ is appropriate when you are contributing to an existing topic (top level). You are simply adding your thoughts on an existing discussion topic rather than replying to portion of a member’s reply. Click on the forum and then the topic you wish to reply to. Click the Post Reply (located at the top or bottom of the forum). Your reply will be posted at the end of the topic. The original topic is listed first, and all subsequent replies are listed below it in chronological order. Here is the location of the reply button at the top…. And, at the bottom of the topic page…. A topic with its replies is displayed as one web page. If the discussion gets too long, then the software breaks it up into separate pages for easier loading and adds navigation links at the bottom and on the forums listing page by the topic – as in 1 – 2 – 3 – Next. The default number of posts to show per page is 30 but can be changed by the system administrator. Reply with quote is a feature located in the upper right corner of the message window. It is critical to use if you are responding to a portion of someone’s message. This works very much like when you are responding to email and you are embedding comments inline someone’s writing. Like in email, you should remove the parts of the message that are irrelevant to what you want to comment on, and leave just the phrase or sentence that you want to focus your reply on. Be sure to leave the original message around the [quote=user] and [/quote], intact, as in the following example. Add your reply after the [/quote] tag. Whether you reply with quote or simply post a reply, your message will be posted at the bottom of the topic in chronological order. That is why it is critical that you use reply with quote if you want to address a specific comment so that it is framed in a border, helping others see what you are answering to. Unless you have made a forum “Read Only” or “Reply Only”, students can post new topics as well as reply to existing topics.